Exact ball speed and spin - the new unique feature of TenniRobo! Have you ever thought about the speed of a ball in table tennis? I am proud to tell you, that with the last app update you are able to select the exact speed and spin for every ball - the unique feature which any other robot doesn't have! The maximum speed of a smash ball from TenniRobo is about 90kph (56mph). The maximum spin is more than fantastic 20000rmp! Right now it's easy to measure your progress with digits! For example, if in this month you can handle 10% faster shots than in the previous - you are growing. But can you handle the same drill with 15% higher pace? This achievement will definitely please your coach! If you are able to create shots with the required speed and spin, then you are also able to simulate a game of PRO players (BTW, who is your favorite table tennis player?). Therefore, there’s an ability to compare your basic skills with someone else’s. If you can handle his/her fastest loops and other shots, then maybe you are a new top player. Maybe it’s just the right time to show the world your skillset! Dimitrij Ovtcharov hits the ball at a staggering 122kph (the thread on TabletennisDaily forum). Really fast, isn't it? The other robots just rotate their wheels with unknown speed thus nobody knows an exact ball speed they provide. 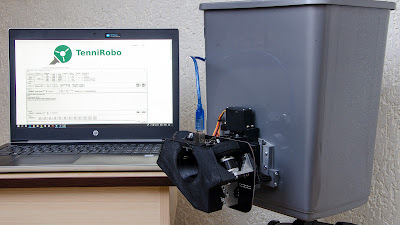 But TenniRobo is a unique robot because it can precisely control the spin of each motor. When a controller says: "Hey, let's rotate this motor with 5400rpm" - be sure that the motor is being rotated with 5400rpm (of course with a little tolerance). Thus when you know the speed of each motor, plus a few additional facts about mechanics then you are able to calculate an exact spin and speed for each ball. The electronic device is mounted on a robot's head and it measures the ball’s speed just after it leaves the head. The measurements are immediately transferring to PC via USB cable. I calibrated it with special equipment, compared calculations with practical results, and all of my doubts disappeared! The tolerance is about 8%, which is a pretty good result in my opinion.